On the day I'm posting this, I am also wrapping up the ninth year of Inappropriate Conversations. The tenth year of this podcast and website is about to begin. Reflecting on that, it occurred to me that some of these shows were either planned as doubles or ended up being a multiple of some sort. This retrospective will look at those occasions, typically in back-to-back postings. Most are #IC podcasts, but Walk The Earth plays a role, too. 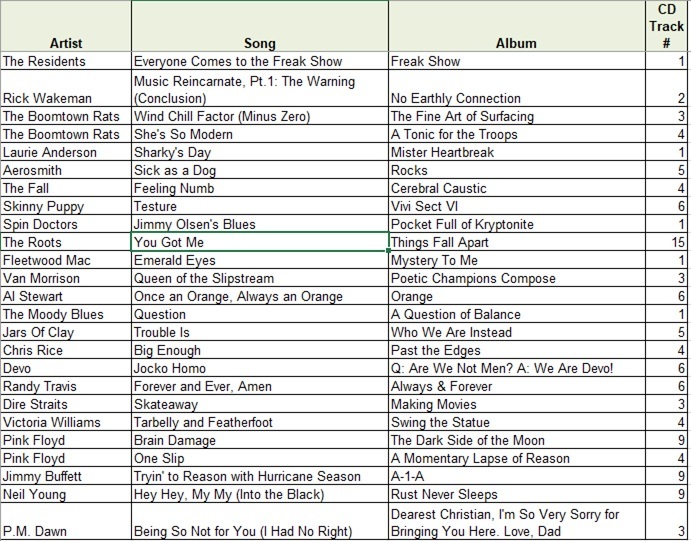 More than a handful of #wte shows are covered in this list. That is 50 podcasts with inter-connections among the 267 released so far in the history of Inappropriate Conversations and Walk The Earth. And maybe, just maybe, more could have been cited. Now that the NCAA has bungled post-season football again, I've taken a second look. 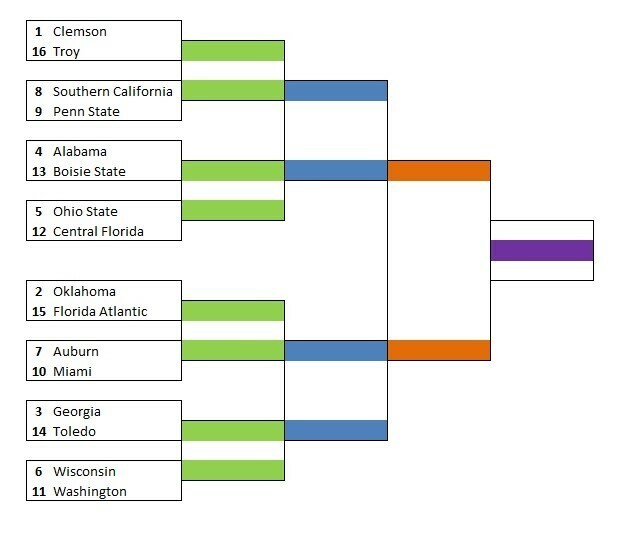 Yesterday, I created my annual 16-team tournament we should be watching with representation from all conference champions. Today, I throw in the proverbial towel. This notion of "power 5 conferences" -- and, doing the math, the other "non power" conferences -- has revealed the need for two different tournaments. That is clear. Even expanding the current format to 8 teams would leave out an undefeated Central Florida team that has blown most of its opponents away, including more than a half dozen wins against bowl-bound teams. So, here is my take on 8s. 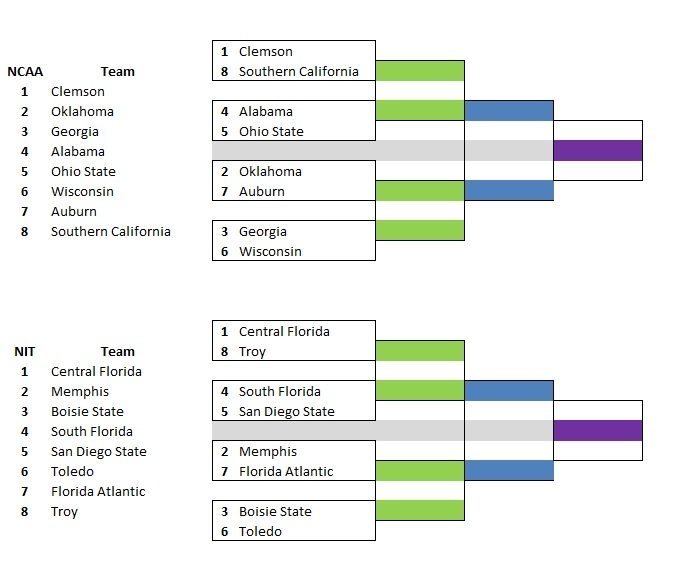 Rather than trying to shove 5 conferences into a 4-team bracket, move to 8 and include all 5 of those conference champions with 3 at large teams. Then, establish an NIT of sorts for the other 5 FBS conferences, who will never get a sniff at any playoffs in our current system otherwise. The National Invitational Tournament in college basketball is the "other tournament" for teams not invited to March Madness proper. 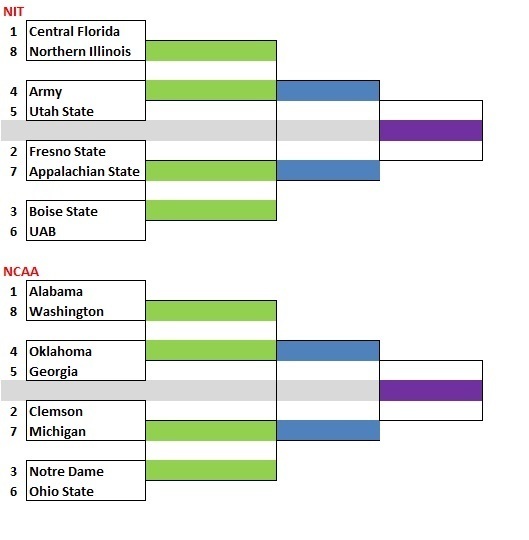 This football version of an NIT would follow the same format: 8 teams including all 5 of the conference champions from the other "non power" conferences, and 3 at large teams from those conferences. 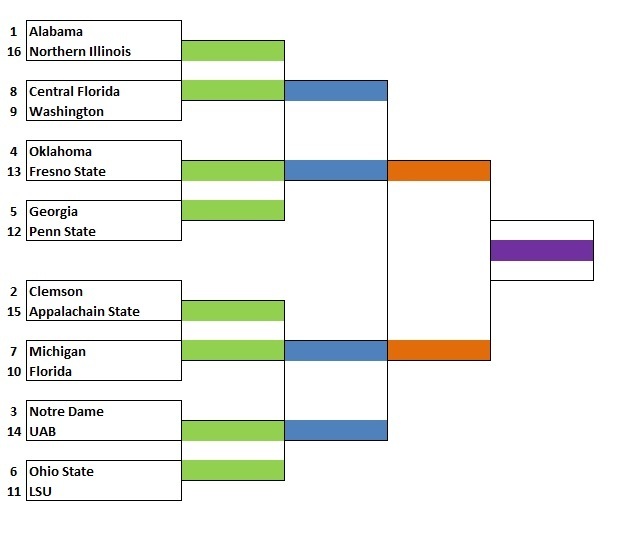 No mixing between the FBS playoff conferences and the FNS (with the "N" meaning NIT or "never getting into our playoffs" division). Two tournaments played at more or less the same time. It's an almost elegant solution to a problem that, clearly, is never going to be resolved by the college sports powers-that-be. I am no longer a child. As I've mentioned recently in Inappropriate Conversations #195, both of my parents are now gone along with their sisters and brother and my grandparents. It is one thing to say I no longer have living parents. Feels quite different to acknowledge that I am nobody's child. For many reasons, I believe that my faith over the decades is both unchanged in any significant way and very different from my mother's. In other words, in the years (and it was years) leading up to her death, I am not the one who drifted. I'm still the man (a young man back then) who has heard answered prayer and lived accordingly. And I know that, in many ways, many in my extended family do not respect that experience. This has left behind a complex experience of grief, beyond the standard mix of love and sorrow. I'd be lying if I said there wasn't some smoldering resentment. I tend to feel that way on behalf of marginalized and dismissed people. Some times, like these, I am among "the least of these" too. On and off for a few months now, I have been reading Accidental Saints by Nadia Bolz-Weber. I would not be surprised to name her a Different Drummer in the future. My year has interfered with my reading. Business trip in February. My mother's death in March. Vacation a few weeks later. Another business trip this week. On the trip before my mother died, I was devouring pages in Bolz-Weber's book, and then I just stopped. Weeks before mom died, I just couldn't pick it back up. Accidental Saints was a traveling companion, along with holding the primary perch on my nightstand, but I didn't read a word. I am a man who believes he has heard answered prayer, but I didn't connect this reader's block with the Holy Spirit. Until now. After once again making this book my traveling companion on a business trip, and after weeks of wrestling with conflicting emotions documented elsewhere, I once again let Bolz-Weber's voice into my head at the start of a long flight home. Her writing style seems conversational to me, so I genuinely hear the words through her voice, knowing how Nadia sounds through more than one podcast/radio interview. I drifted back to the end of the last chapter I'd read from the middle of her book, then the next. Nothing striking or odd about the passages I'd missed. No reason to think a wiser force was holding me back. Then I got to a chapter called Parlors. It stopped me in my tracks. I had to wipe away tears. No mistaking why I somehow couldn't read those words before my mother's funeral, before my wife had read hurtful journal entries about my parenting from the one who raised me, along with other reminders that my parents were never going to recognize some of my friends as anything other than dangerous threats to my marriage -- based on nothing more than gender. Before the Holy Spirit permitted me to hear from Bolz-Weber earlier this week, no one was really capable of speaking words of comfort to me. I needed to know that it was acceptable, even natural, to feel love simultaneously with resentment, regret, disappointment, and even anger. I needed that, and I needed it specifically now. More than a month needed to pass, for one thing. For another, I needed to be alone, even the "alone" you feel in an airplane packed with people. Perhaps I don't need to say that "Parlors" is a brilliant chapter in a wonderful book. Consider this a recommendation. I will share the passage that blessed me with an assurance I've been lacking lately. There is so much more, though. Clearly the author knows this. A year ago she shared the chapter (linked above, when I first called it by name) in a Patheos blog. "As sacred as love is, human love is never pure or perfect. We just aren’t that kind of species. There are cracks in everything and even the most shining aspects of our lives—even love, or perhaps especially love—come with imperfection. "Often, when someone dies, we feel a combination of love and something else, and this, too, is holy. And entirely human. And they don’t cancel each other out. Love and anger. Love and disappointment. Love and emptiness. We always love imperfectly. It is the nature of human love. And it is okay. "But despite all the love in the world, when it comes down to it, none of us can know the reality of another. We can share circumstances, personality traits, even parents, yet as much as we move through our lives alongside each other, none of us can fully know the internal reality of another." I'm hopeful that Inappropriate Conversations cannot be limited to a single point and that I have more points and questions to raise in the future. Surely one of those points, though, is that we Christians too often presume that we can know the internal reality of other people, and know it so well to justify abominations like denying them communion or trying to separate them from the people who love them most for reasons that have nothing to do with what Jesus taught and demonstrated. The other mistake is believing the very imperfections that make us human either separate us from God or justify an all-too-human tendency to play God ourselves by presuming we can or should separate the sheep from the goats, so to speak. That answered prayer I mentioned earlier was God telling me that I shouldn't remain silent. I needed to speak up because, in unexpected ways, the words might be more than just my own. Avoiding the risk of getting it wrong (often, in fact) is itself too risky, too high a price. It's far better to say something that should not be said than not to say something that should be said. The right words at the right time have been, for me, a call to worship this week. "Ring the bells that still can ring. Forget your perfect offering. There is a crack, a crack in everything. That's how the light gets in."